Investing time in intense learning and knowledge exchange brings your company to the next level. Through insights and the development of new skills you can create a real, constructive learning environment for a whole week. This intense and focused learning format allows you to continually improve internal communication, help improve employee skills and deepen the shared understanding among teams. Most importantly, employees share their own knowledge and experience within your company to foster a collaborative understanding of important and helpful topics! 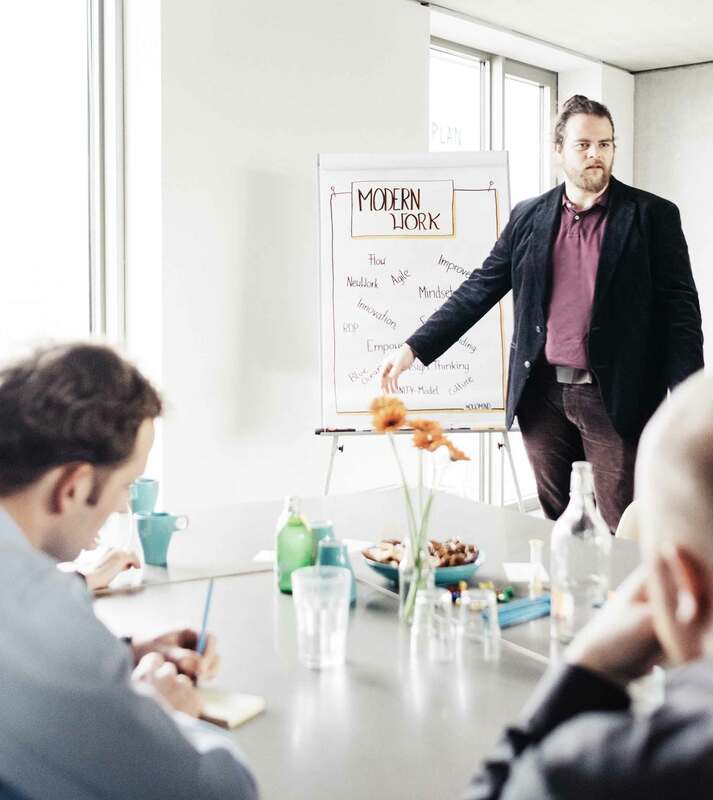 We are experts in learning and ModernWork, and we work hand-in-hand with you to create a challenging and interesting agenda for the Week of Learning in your company. We support you in finding out the most important topics, matching the right people with the right formats with a view of the bigger picture. During the process we are the experts for methodical and didactical composition, and you are the experts for your company’s needs, challenges and next steps. We connect the knowledge within the company with the requirements for the employees. If needed we can provide additional speakers and trainers to fill in the missing pieces for your week of learning. If needed we can we can train the speakers and trainers in presenting and conceptualizing their sessions in a more tailored way.We can also moderate through the week of learning if there is no-one available within the company. We will be your sparring partners for the whole process and support you during preparation, execution and the reflection process. The Week of Learning is a company wide event with focus on learning, knowledge sharing and connecting. It’s all about learning from each other to get a better understanding of important topics within the company. We can provide the necessary tools for the Week of Learning with various formats, such as Keynotes, Training, Workshops, Fishbowl discussions, Ask me Anything sessions, Company essentials, Impulse talks, Fuckup talks, Visual Recording and more. We are proud to say that the Week of Learning format is the most extensive of its kind. This week encourages participants to focus on development and improvement, to foster skills and to share as much knowledge within the company as needed! 3. Planning: Goal setting, Roadmapping and defining content. Role expectations, tasks and to dos. Finding out who could do sessions within the company. 4. Detailed planning: Who is doing what, exactly? What are the specific topics? Who needs what kind of support? Sometimes a ‘train-the-trainer’ workshop is suitable to conceptualize, sometimes Speakers Workshops. 5. Week of Learning takes place: Support, guidance, facilitation. 6. Aftermath: Reflection and feedback. Possible next steps and unanswered questions. Sending the minutes, pictures and additional material to the employees. 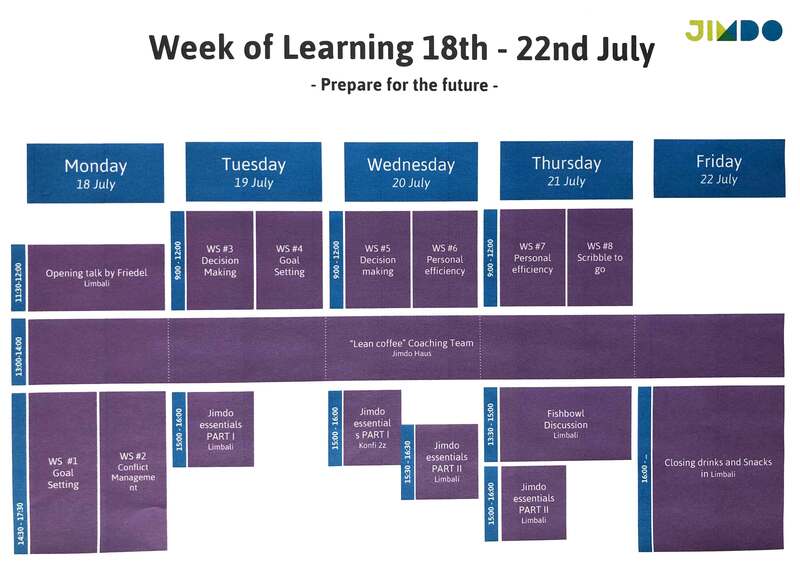 How can we make the ‘Week of Learning’ format interesting for everyone? We take care of this in the conceptualizing phase. As well as specific specialist topics, you can always include important, company-wide topics like Mission, Boundaries, Company essentials and more. Softskill topics can also be useful for everyone. How big does the company need to be for the Week of Learning? In general you can do this format with a range of sizes, but of course the planning and the week itself differs depending on the size of the group. With a company of more than 100.000 employees it will become difficult to align everything and everyone. Here we would recommend doing the Week of Learning in individual departments. Do we have enough knowledge within the company to fill all the formats? The answer to that is simple - yes! The challenge is to find out what the important topics are, but we will help you here. If you don’t know who the experts are for certain fields, this is something you can learn during the Week of Learning. What about the real work during the Week of Learning? In our experience there is no company where everyone can stop working at the same time and, of course, that is completely fine! But even if the goal is not to have employees in sessions for the full week it is more important that everyone gets the chance to attend to at least one or two sessions. If more is possible, even better! Chaos and order - how do we manage everything?